I have finished the artwork for the 32 Class box. This will be printed on high quality card and folded up into the box lid. Click on the picture for a larger image. 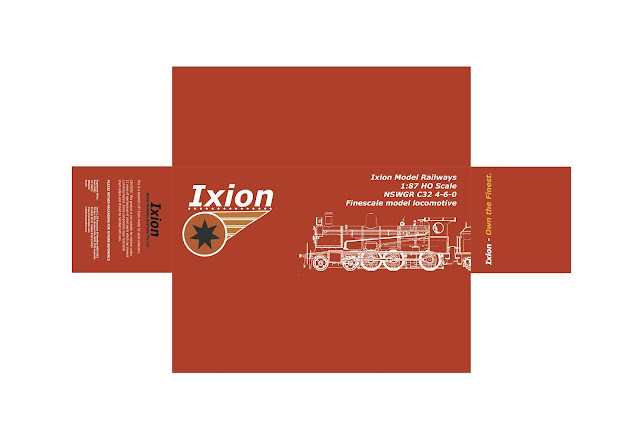 If the quality is high enough to allow the viewer to read the text on the end, the eagle-eyed will note the details there are for the new company, Ixion Model Railways Australia Pty Ltd. This company has now been established and registered, and the bank account will be operating next week. This will allow for a much wider range of ways for customers in Australia to purchase from us, including cheques and direct deposit.